Brendan Ekstrom, second from right, confronted a fan in St. Louis on July 21. 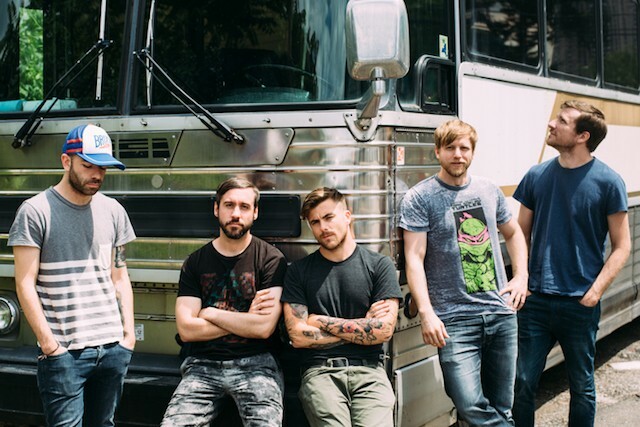 Last Friday, Brendan Ekstrom, guitarist for Circa Survive, was playing a show at the Pageant (6161 Delmar Boulevard) when he abruptly walked off of the stage mid-performance. While the audience was left wondering, Ekstrom has since explained that he saw a disturbing scene unfolding in the audience. In a series of tweets the following day, Ekstrom writes that he was watching from stage while a man in the audience made a number of unwanted sexual advances on a woman. Ekstrom says he got security's attention, but they were unsure about where he was pointing at. The guitarist decided to take matters into his own hands — and left the stage without notice to anyone confront the situation on his own. Ekstrom writes that he confronted the man who he says was "dumbfounded when I showed up as if nothing was wrong." Ekstrom returned to the stage within minutes to finish the show as security handled the situation from there. "It wasn't cute," he writes. "It was alarming. I'm forty and flirting doesn't look like that. Maybe it's because I have a daughter or that I'm older ... but it made me furious to watch a girl forcibly remove someone's hands from her body multiple times." His explanation on Twitter was met with almost entirely positive feedback and virtual applause. Sounds like you did the right thing man. Good looking out. Circa Survive was performing at The Pageant with AFI and Citizen as a part of its summer tour promoting The Amulet, which will be out September 22. The indie-rock band is based out of Philadelphia. Hats off to Brendan Ekstrom. It's hard to imagine many other witnesses — much less musicians performing on stage — handling the matter like he did. We can't help wishing there were more.